Round two enters and against all prior season opener indications, round two leaves us even MORE in limbo as to what could happen as the championship unfolds. It’s a great thing when a fresh season kicks off and and the rule appears to be chaos. Plain and simple. Not only is Jason Anderson, last years champ, not exuding even a modicum of dominance through two rounds, he was passed and disposed of in short manner by a first time winner, a guy who only two short years ago looked to be wrestling his bike around the tightly confined SX tracks. Blake Baggett has done what few have in history, especially in the stadium series: he’s found the magic key that unlocked Pandora’s box. That key has a name and it is Michael Byrne. This is no fluke or just compounding of coinciding solutions, Michael Byrne has done this before, albeit not with the resulting W though. 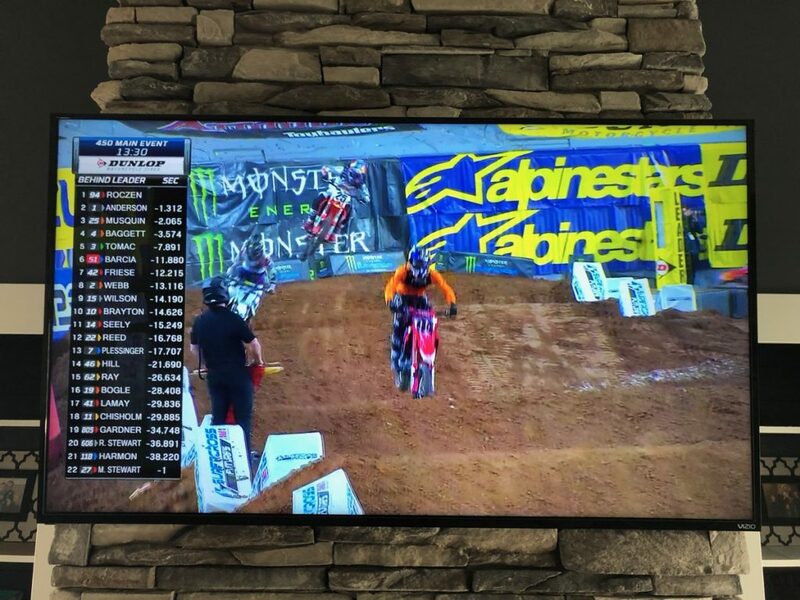 Remember a few years back when Michael Byrne began helping Mike Alessi when he was still giving it a go on Supercross tracks. Mike didn’t turn the Byrner-effect into dramatically improved results but it is undeniable that with Michael Byrne assisting fun setup, Mike looked like and utterly different rider indoors especially when it came to navigating the persistently troublesome whoop sections. It was quickly noticeable after Byrner and El Chupacabra began working alongside each other that something clicked with Blake. Call it confidence, call it setup, call it a lightbulb going off; it’s all of those. It’s the unlocking of a door. We’ve seen it from Blake in the outdoors and now when you combine the obvious improvement, the killer instinct, the W and the undeniable confidence, ladies and gentleman, Blake Baggett has thrown his hat in the ring as contender. The transponder reported gaps above are the obvious solution for a proper restart. That Red Flag is nano-seconds from being waved at Ken. Sooooooooo, Ken gets the green flag pointed at him to take off and stop watch is started, at 1.312 seconds the green flag points to rider 2 braaaaaaap, at 2.065 the green flag points to rider 3 ziiiiinnnngggggg… at 3.574… I’ll let you guess, YUP! The green flag points to rider 4 and they take off like a bat outta hell. IT’S THAT EASY!! Why do we have to punish these dudes who have created gaps between them and the field and reward the other guys who have been getting dropped? Isn’t the idea to restart the existing race progress? Because bottling these dudes all back up together is creating a new race and “eracing” (hehehe) the completed progress that ALL these guys have worked themselves into. How about those Jason Anderson podium statements? That was honestly the first time I’ve ever gotten the sense from Jason that racing has become a serious focus for him. Obviously that sounds ridiculous because the dude is a 450 champion but hear me out. Jason has always been the dude cut from a different cloth. Laid back, easy going and not letting the pressure or head games affect him. He’s put Cole Seely on the ground multiple times and plenty of other dudes as well, never with any hint of regret or guilt. Then following the restart, he puts a wheel in on Ken two laps in a row in the same corner before taking it out and he feels bad about it?! Let’s be clear, that move was not dirty, it was insinuated twice before being delivered. Everyone knew that was coming, and I’m not real sure how Ken let it happen. Jason’s words of regret hit me like a guy who is starting to feel the, not pressure but weight of the sport as a career and an opportunity to make hay while the sun shines. That old often mentioned idea of champions needing friends on the track in order to succeed perennially. Jason’s got his first title and they all say backing it up is even harder. With Jason’s podium words, I hear Aldon Baker in his ear and finally getting through to him that he does indeed need friends out there, or at least he needs to stop giving so many riders reasons to put a target on his back, he’s already got the slanted vertical target on his number plates. Perhaps Jason just really feels for Ken and his injuries the last few years and honestly, simply feels guilt for taking him down? Could be as simple as that. I think we’ll get more evidence in the coming weeks as to which side of the new leaf Jason is leaning toward for 2019. The rule is in place, everyone has to live with it. They do it in virtually every motorsport the same way. It is not a rally. Look at Formula 1. They do this silly timing thing and it just adds to the boredom. This procedure also adds excitement! Is it artificial? Sure, but what about any sport isn’t? All these folks didn’t just happen to meet out in a field, make a few obstacles and take off. There are bigger issues than restarts, and after all, how often do they occur? This seems more like Roczen worship, and feeling bad about his misfortunes the last few seasons. So your restart suggestion; I like the theory, but in practice it won’t work with a guy waving a flag. Look at the numbers; you’re going to be able to wave a flag 1.312sec after the first? Then the next gap is 0.753sec. Keep on going..look at the gaps towards the bottom? You’re going to be able to wave, in separate, distinct motions, and correctly timed, gaps that are 0.406sec apart (17th and 18th)? How about 0.436sec for 9th and 10th? Let’s say you are a super human, who can accurately time these small increments from one another in sequence, and get the flag motions to be distinct as well…but now you’re also talking about a guy that is standing, what, 20 yards away from the riders from mid-pack on? How are you going to keep track? If you’re sitting there in 16th place, are you going to start counting to yourself every time the flagger releases a rider? Are you going to just assume the guy in the front of you is going at the right time? If you really want to go this route, then we need a gate system whereby the gates can be separated and are portable, and can be placed in the staggered formation. They are then electronically tied into the timing system and controlled by it, and each gate will open indepedently after the correct interval, thus giving each rider the proper spacing and time that they should be at – i.e. the same gap they had on each other when the red flag came out. …but by waving a flag? No way. Look at how awkward that restart was with a SINGLE flag wave starting it off.